Delhi assembly on Friday passed the Janlokpal Bill, incorporating suggestions of Anna Hazare, which provides for an ombudsman with powers to act against any government functionary including those of the Centre even as Chief Minister Arvind Kejriwal warned the National Democratic Alliance dispensation against any move to put a spanner on making it a law. Kejriwal termed it as a "historic moment" for the Janlokpal movement and offered his tribute to veteran activist Hazare recounting his days with the 2011 India Against Corruption movement. The bill received 64 votes in its favour in the 70-member Delhi assembly. Reacting to allegations that the bill was a diluted version of the one that was tabled in 2014, Kejriwal wondered whether BJP or Congress-ruled states would be able to pass any such legislation. "Few people are saying it's weak. So try and pass a weak law only in the Bharatiya Janata Party or Congress ruled-states. If Centre does not approve the bill than we will have to bend our fingers and BJP will face the same situation like Congress," he said. As per the changes, there will be a provision for one more high court judge, one eminent person and one former chairperson in the selection panel of Janlokpal. While the impeachment process for removal will begin only after a higher court monitored probe of any allegation against the Lokpal. A strong Janlokpal is important to ensure that such drive against graft continues even if we are not in power, Kejriwal said. He also alleged that the Centre had made the Anti-Corruption Branch dysfunctional. "The biggest step we took in our first term was that we had filed FIR against Mukesh Ambani. But since June 8, when the ACB was taken over by Prime Minister Narendra Modi, there has not been a single notice against Ambani. We had even started summoning Reliance officials," he said. Kejriwal also defended the provision which brings even Union government ministers and officials under the ambit of the bill. 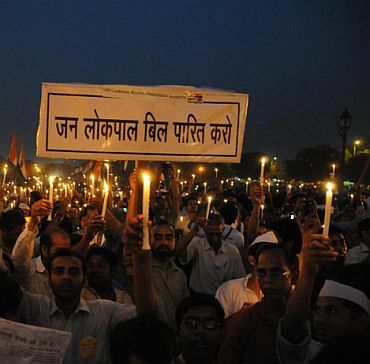 As per provisions of the bill, Lokpal will have powers to even probe acts of corruption against Union Ministers and central government officials working in the National Capital Territory of Delhi, which may trigger another round of confrontation between the Kejriwal government and the Centre. "If the prime minister commits any crime an SHO can take action, but if he indulges in corruption there is no one to take action in such cases. This is why need a Janlokpal," Kejriwal said. Earlier, a four-member selection committee, chaired by the Delhi high court Chief Justice, was proposed to select the three-member Lokpal. However, on suggestion of Hazare the committee now has now been expanded to seven. In the original draft, it was proposed that the Lokpal can be removed only through a process of impeachment and it will require at least two-thirds majority in the legislative assembly. AAP has an unprecedented 67 MLAs in the 70-member Delhi legislative assembly. However, as per the amendments incorporated today, such a move will be initiated only after a report by the Delhi high court in this regard. Without taking any name, the chief minister wondered why the move to include functionaries of central government working within Delhi's boundaries under Lokpal's ambit was attracting opposition. "When we filed cases against a Congress minister, people supported us. But now that we are fighting BJP, there are voices of opposition," he said, adding Lokpal Bill was indeed a political document. The Lokpal, with its own investigating wing, will make probe time-bound, with maximum time limit for completing an inquiry fixed at six months. In exceptional cases, the time limit can be extended up to 12 months. The bill seeks to provide full protection to whistle blowers from physical harm and administrative harassment. For this, the Janlokpal may issue orders and directions to the government or any other authority to provide security and protection to whistle blowers. Janlokpal will have a prosecution wing and may appoint investigating officers to be called Janlokpal investigating officer who shall have all the powers of a police officer under the CrPC. As per the provisions, Janlokpal may sanction prosecution of public servants for offences committed by them. It will also have powers of a civil court for discharge of its functions. It may attach, confiscate assets gained by a public servant through acts of corruption, besides having powers to recommend transfer or suspension of a public servant accused of corruption. The bill also envisages action against private entities involved in acts of corruption and makes it incumbent upon public servants to make public the details of properties owned by them and their dependents. VOTE: Do you agree with the Delhi government's odd/even car proposal?